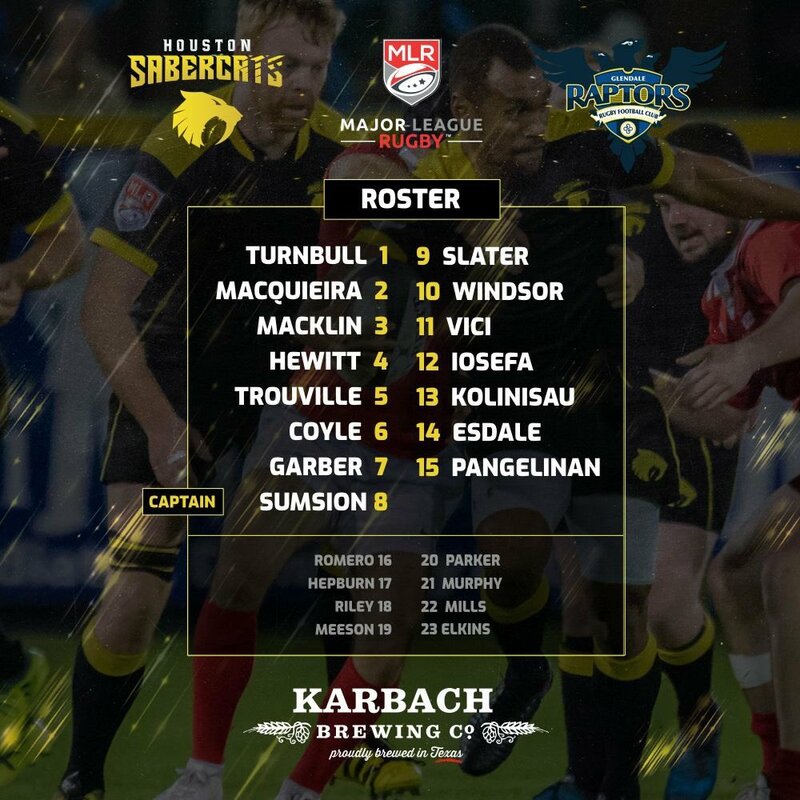 The Glendale Raptors welcomed the Houston Sabercats to Infinity Park. With the bonus point victory, the Raptors were able to retake first place from the Seattle Seawolves. Meanwhile Houston continues to disappoint after a promising preseason. The teams played opposites throughout the match. Glendale started strong and finished slow, while Houston started slow and finished strong. Harley Davidson scored the opening points of the match off a perfectly weighted kick from Maximo de Achaval. Davidson was able to get under it and take it in for the try. Davidson added a second try five minutes later. Ata Malifa was able to draw in the defenders before offloading to Davidson for the try. Sam Windsor looked to add the Sabercats first points of the match with a penalty kick, but he pulled his kick to the left of the sticks. Dylan Fawsitt extended the Raptors lead to 17-0. Harley Davidson looked to complete his hat trick in the first half but was held up short of the try line. Fawsitt was there to clean up and he powered his way over for the try. Josua Vici was the man responsible for the Sabercats first points. Zach Pangelinan drew in the Raptors defenders and offloaded to Vici who was clear in for the try. Maximo de Achaval had a chance to add to the Raptors lead, but he pushed his penalty kick to the right of the sticks. The Raptors had the majority of possession in the first half, but didn't have that much to show for it. They only scored three tries in the first half and could've had more if they were able to hang onto the ball. Houston started really slow as they didn't really get going until 30 minutes into the match. Houston responded well at the end of the first half to get the score to 17-7. Harley Davidson completed his hat trick six minutes into the second half. He stepped right in front of a wide, flat pass from Connor Murphy and ran 50+ meters for the hat trick. Matt Trouville side stepped Kevin Lynch to score the Sabercats second try of the match. Maximo de Achaval went on his own for a 45 meter try. He was able to run around the edge of the Houston defense and power through a high tackle for the try. He extended the Raptors lead in the 63rd minute with a drop goal. Alex Elkins started the Sabercats second half run. After a line break from Osea Kolinisau, Elkins was in perfect position for the offload and try. Maximo de Achaval extended the Raptors lead to 37-19 with a penalty kick from just inside the 10 meter line. Alex Elkins scored his second try of the match off a nice inside pass from Conor Mills. Both teams looked to score in the last moments of the game, but the Raptors decided to kick to touch to end the game. This was a very slow start from Houston. If they hadn't had such a slow start, they might have had a shot at the end of the match. Connor Murphy and Conor Mills were relegated to bench this week. It seemed to have an effect on those two. When they entered the match, the pace and play of the Sabercats picked up. I think they received whatever message coach Justin Fitzpatrick was trying to send. Glendale will be happy to be back in first place and to have secured a spot in the MLR Semi-Finals. But they won't be happy with their performance. The Raptors know they didn't play their best. They didn't attack like they wanted to. 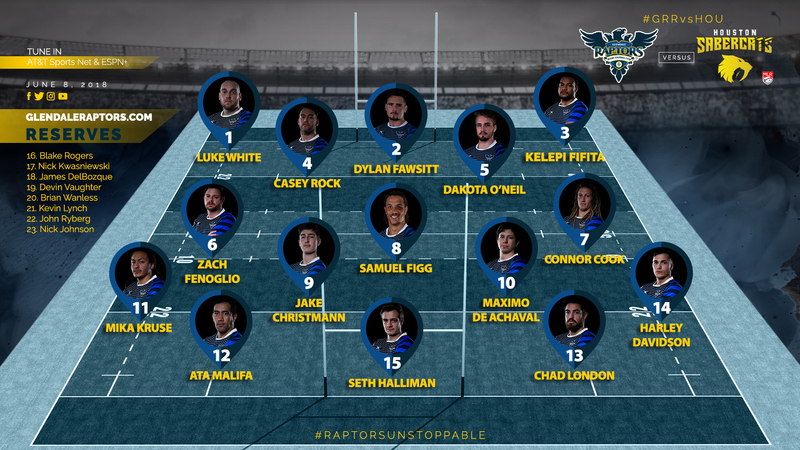 And the Raptors left too many opportunities on the field due to handling errors. Harley Davidson is having himself a year and with USA Eagles head coach Gary Gold in attendance, look for Harley to wear the Eagles jersey in the future. Glendale gets an extra day to rest as they welcome the Seattle Seawolves to Infinity Park in a battle for first place on Saturday, June 16th. Houston has a week off before they travel to Utah to face the Warriors on Saturday, June 23rd.